PULSE sharing South African culture with Toneheim students! 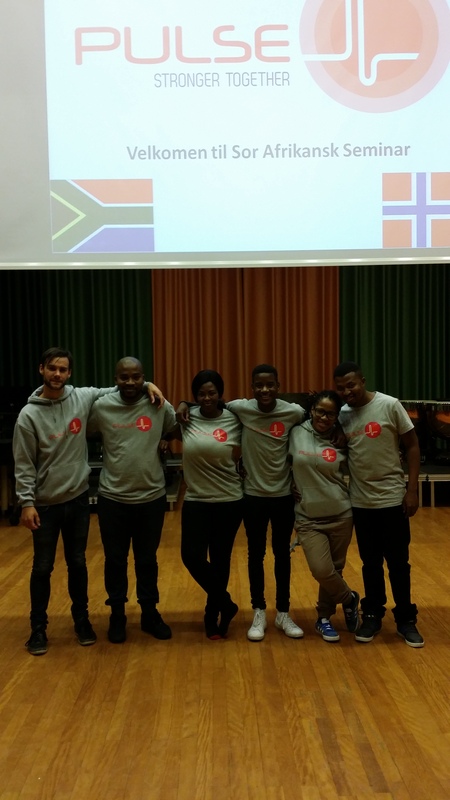 On Saturday it was our first project to work together as the new South African Pulse team in Norway. We had a great seminar at Toneheim were we shared knowledge about South African lifestyle, Field Band Foundation and Pulse. We were showing and talking about the methods that we use when we work with Music, Dance and Life skills for the youth of South Africa.We focus on developing Leadership skills, Mastery and Self esteem for youth that come from Disadvantaged areas. Pulse believes this can lead to positive, active and healthy communities. In Norway Pulse has many of the same goals but with a special focus on Including Minority groups into the bands. We use South African methods to recruit members from different backgrounds into the bands. This weekend we got an opportunity to teach students of Toneheim South African games and a famous song called Shosholoza, meaning “Moving forward!”.